Edmonton has been recognized as one of Canada’s largest cities to support fair trade. Earlier today, Fairtrade Edmonton made the official announcement that our city has achieved all the requirements needed to be dubbed a “Fairtrade Town.” We join the list of 16 other Canadian communities, including Toronto and Vancouver. Fairtrade Canada is a national, nonprofit Fair Trade certification organization that focuses on certifying, licensing and promoting fair trade products across the country. It’s a branch of Fairtrade International, which sets international standards and helps support producers of fair trade products across the globe. They began recognizing Fairtrade Towns in 1999, in England, and now have over 630 Fairtrade Towns in 18 countries. -Political Support. For example; Edmonton City Council agreed to purchase only Fairtrade certified products for their City Hall offices. -Availability of Products. Over 85 cafes and stores in Edmonton sell fairly traded goods. -Community Support. Workplaces, faith groups, & schools use and promote Fairtrade certified products. – Public Education. Public awareness events and media coverage regarding fair trade practices and products. – Fairtrade Town Committee. A steering group has been created for continued commitment to the cause. – Keeping the Momentum. Other ethical and sustainable initiatives are promoted in the community. Learn more about Fairtrade Canada by visiting their website at www.fairtrade.ca, their facebook page, or their twitter account. Awesome to hear and thank you for sharing! Do you have the list of those 85+ cafes and stores? 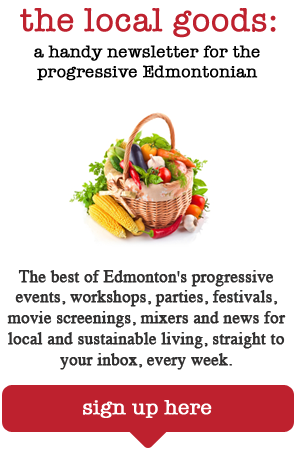 Thanks for the comment, Tineke – I’ll follow up with Fairtrade Edmonton and see if I can find a comprehensive list.